At Nikon, the design and production divisions cooperate from the early development stage to realize superior quality in the manufacture of digital cameras and interchangeable lenses. Manufacturing includes the processes of design, trial production and mass production. To create high quality products, the teams involved in each process must collaborate effectively. When design and manufacturing teams communicate from the early stage of product development, designs are shaped with mass production in mind, reducing late-stage design modifications and defects. Nikon's digital cameras and interchangeable lenses are manufactured at factories in Japan and overseas. At all our production facilities, we assemble teams of individuals involved from the design stage through to mass production, ensuring clear communication between everyone who works towards the finished product. 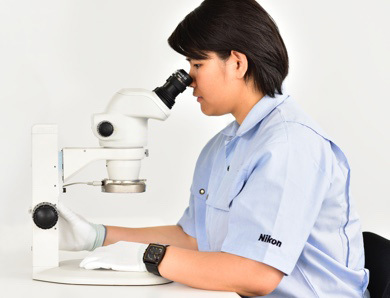 The employees of Nikon Thailand Co., Ltd. (hereafter, Nikon Thailand), the company manufacturing the lenses for a new Nikon product, gathered together with Nikon employees responsible for design and manufacture during the pre-manufacturing trial production and verification phases. Team members make prototype lenses by arranging the necessary molds and parts shown on the blueprints, carefully checking that the products perform as they should. They must be durable enough for customers to use them with confidence, constructed without incident in a timely fashion during the manufacturing process, and without any variation in the finished product. Throughout the process, the team repeatedly evaluates and verifies that everything works perfectly and resolves any issues that arise. The Nikon Thailand team believes in the importance of direct communication with designers. They known that productivity improves when they can directly ask questions about the design concept and learn about issues that came up in the process of creating previous products. For Nikon's designers and production engineers, the knowledge base at Nikon Thailand is invaluable. Our teams come together as a unit with one single goal: to create superior quality products. Nikon Thailand employees had the following to say about their future goals. Jeng: "We’re aiming to produce this new model without a single issue." Noo: "I hope to increase productivity by further automating processes at the factory." Kai: "Working towards more efficient development, I will share information on any issues that crop up during manufacturing." 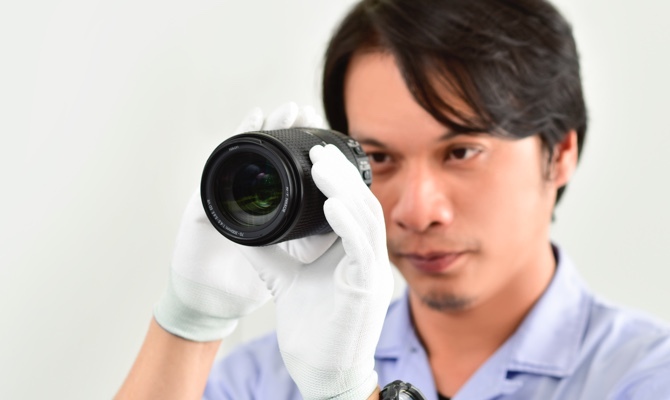 To deliver products trusted by customers, Nikon aims to improve all the processes involved in the manufacturing process, strengthen collaboration and continuously improve quality. Nikon is never content to keep using current methods and techniques without improvement. Nikon conducts small group activities with Nikon Group employees from Japan and overseas, with the objective of nurturing a high level of quality awareness among Group employees. During these activities, colleagues form groups at their work sites and study issues that have arisen, working to come up with solutions. 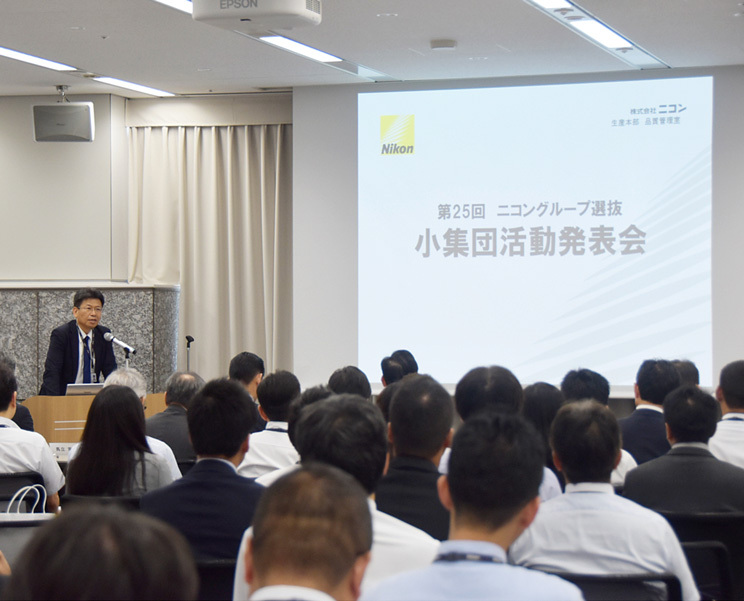 Over 5,000 Nikon Group employees currently participate. 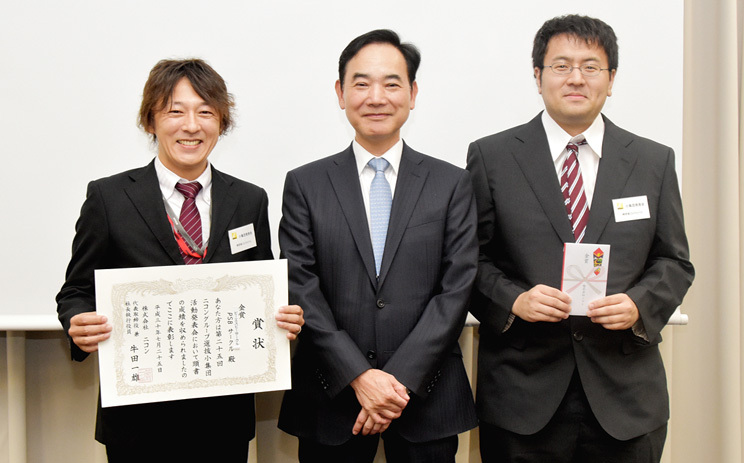 The president of Nikon and company executives also participate in the Nikon Group Small Group Activity Awards Presentation each July, where teams are selected for their outstanding work in each small group activity department. This positive exchange of ideas eclipses established business departments, motivating everyone involved to continue these activities on a larger scale. In 2015, the international community adopted a set of targets for sustainable development, to be achieved by 2030. The 17 global goals address issues such as poverty, hunger, education and climate change. Introducing Nikon's efforts to improve the quality of its products and services.